What made you begin using the paint layering technique exhibited in the piece? I read the book, “Rethinking Acrylics” by Patti Brady and was intrigued by the variety of effects that one could achieve with gel mediums and pastes. Soon after, I purchased a sample kit of Golden Mediums and Pastes. I spent days playing in the studio. I started making a batch of modern abstract Oklahoma landscapes. At some point along the way, I started adding words cut out from magazines. The process slowly developed from there. Do you plan out the colors and concept of the layering before you begin or does the process evolve naturally? Please explain. I always know my palette going into the creation of a piece. I do not necessarily know the color that will be used to age / patina a section as the layers develop on the piece. I have found that the properties of liquid fluid acrylics are great for staining and often I apply glazes to give a “weathered” feel to the piece. This piece in 24 works is from the very early stages of the series. In many ways, I was still adjusting to the learning curve of using the acrylic additives. Thus, the layering of acrylic paint and various mediums over the collage magazine scraps are an intentional decision within the design and layout of the piece. But, equally important, I try to keep an open mind as the medium layers interplay and build up amid the painted hues on the paper. Both then and now, I strive to let the piece have some freedom in finding its own direction while also staying on course with my own artistic compass intended for the artwork. The question is tricky because I find that I have to answer ‘yes’ to both. Yes, I know the general design, feel, layout, color combinations, and inspiration going into a piece. At the same time parts of the process evolves naturally because the layers within this piece are built around the unique traits of the gel mediums / pastes (such as absorbency or water repelling properties) and how they react to each other with the paint on paper. 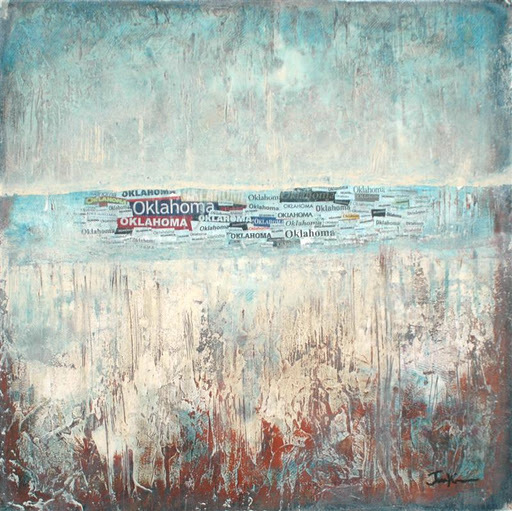 Last week we announced a new 2012 exhibition featuring Oklahoma artists, Concept/OK: Art in Oklahoma. 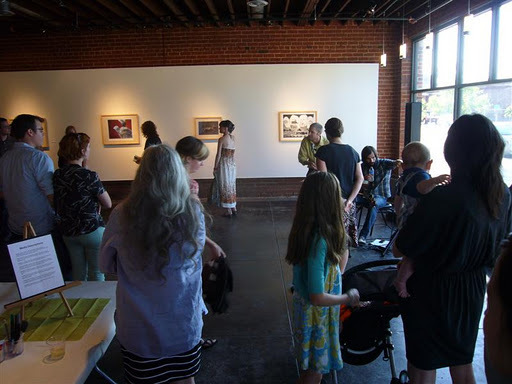 The exhibition is an open call survey of Oklahoma artists’ work along with extra components to encourage audience involvement and more attention for artists. I want to give you some background on how we planned the exhibition. Since we are always striving to serve more artists and serve them better, we constantly assess how our programs impact Oklahoma artists. This is only one of the many ways that the Oklahoma Visual Arts Coalition (OVAC) is trying to create opportunities for artists. After several years of assessment and strategic planning, the Exhibition Committee decided to create a new exhibition opportunity. Many artists and educators served on the Exhibition Committee during the development of the Art 365 and Concept/OK exhibitions. Members involved at various points in the planning included: Tomas Batista, Elizabeth Brown, Stan Carroll, Jean Ann Fausser, Anita Fields, Sarah Hearn, Skip Hill, Jonathan Hils, Pam Husky, EK Jeong, Jackie Knapp, Kathy McRuiz, Shawn Meyers, Audrey Schmitz, John Seward, Carl Shortt, Suzanne Thomas, Jeri Wensel, and Elia Woods. After several years of evaluation and planning, the committee introduced the new survey exhibition structure to the OVAC Board for approval in early 2010. First, we assessed juried and curated exhibitions already taking place in Oklahoma, trying to make sure the OVAC exhibition does not duplicate other opportunities. We decided that we should focus on what could make the exhibition exceptional for the participating artists as well as the exhibition visitors. The committee emphasized increasing cash awards, growing the audiences, improving education for the community, and working with a partner gallery on a consistent basis. We agreed we should highlight all artistic media and connect the artists more closely with curators. We retained the basic expectations that the exhibition feature living Oklahoma visual artists, be open call to allow anyone eligible to apply, involve national curators and not censor artwork. A completely new component, the curator will pick up to 5 artists from the Survey entries to be Focus artists. 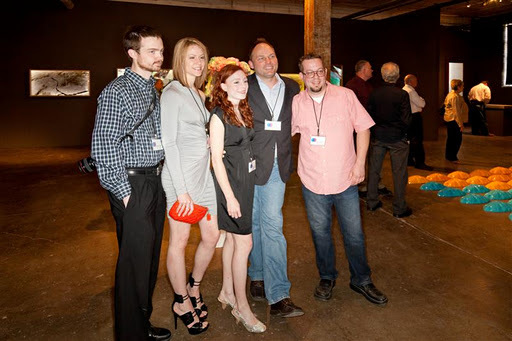 The Focus artists will show a small body of work in tandem with Kansas City artists. The Oklahoma artists will then exhibit in Kansas City. The committee conceived of the Focus as a way to offer special awards to artists and more interaction with the curator and regional art community. 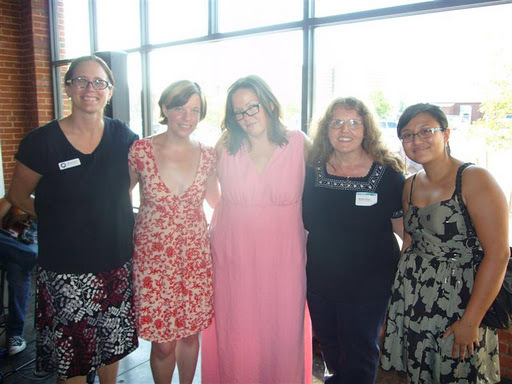 Another new element for Oklahoma exhibitions, two artists will be chosen for Residencies. Chosen from proposals, these artists will have longer to develop their work, which must engage the public. In planning, we decided Residencies would connect artists to the public more intimately. We hope audiences will learn more about the artists’ ideas and process for creation. Also, the Residencies link to the Hardesty Arts Center’s future programming. Since OVAC does not have a gallery space, we instead work with museums and art centers that have compatible missions to present the exhibitions. The new Hardesty Arts Center is a perfect partner for Concept/OK because of its innovative educational programs, emphasis on connecting living artists with audiences and wonderful new galleries. Watch for more about the Center in a future blog post or read about it on the Arts and Humanities Council of Tulsa website. We are thrilled for the launch of Concept/OK: Art in Oklahoma and hope the exhibition serves the artists and public well. You can read history of the Oklahoma Visual Arts Coalition’s exhibition programs here. Exhibitions OVAC now coordinates include Concept/OK every two years, Art 365 triennially, Momentum OKC and Tulsa annually, and, with Individual Artists of Oklahoma, 24 Works on Paper every two years. Visit www.Concept-OK.org for more details about the exhibition and call for entries. What was the technical process of creating this piece? This was an etching done a zinc plate. The image was created by etching the plate with nitric acid. This involved several steps, blocking out part of the image with asphaltum and continuing to etch those areas I wanted to be darker. I also used mineral spirits, etc. 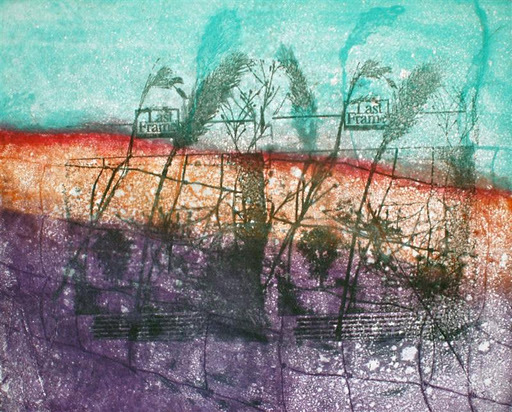 The fence portion of the piece was done by using a mylar overlay made from a Xerox print, along with wild grasses. This image was etched on top of the background. The plate was inked with oil-based etching inks in three colors and printed on dampened printmaking paper, and run thru a printing press. The urge to collect objects is my powerful, inborn passion. My love in experiencing the elements of grasses and other natural elements, makes me become part of the natural world. 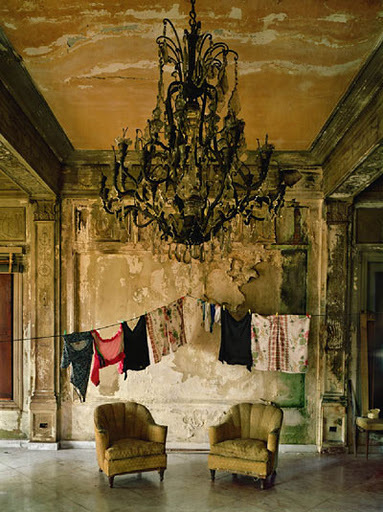 The viewer’s attention is directed to the fragility of nature, its beauty, and preservation. The casual observer can find beauty in the most commonplace pieces of nature as the natural world is experienced. The relationship between nature and humanity are solidified as the environment is contemplated. This interview features an artist from the 24 Works on Paper exhibition, which is on display at Rose State College in Midwest City. 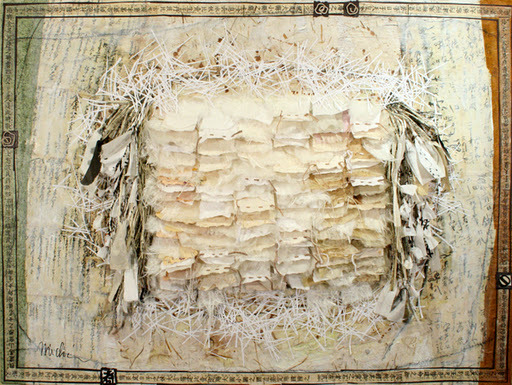 A collaborative exhibition from the Individual Artists of Oklahoma and the Oklahoma Visual Arts Coalition, this exhibition tours until September 2012. See more in the catalog and at www.24works.org. How did you discover printing photos on watercolor paper? I am primarily a painter, and I take photographs to use later as ideas or inspiration for paintings. While working in OSU’s Art Department, I provided the printing for a workshop with Barbara Robertson, an artist from Seattle. She requested Rives BFK as the paper for her workshop. It was during my interactions with her that I began to think about printing my photographs on watercolor paper. I felt it would help create the right mood for the images. Since I like building texture in my paintings, I had been trying to find a way to transfer that to my photographs, and I realized the texture of watercolor paper does create a greater complexity in the photographic images. What interests you about the abstractions and textures of nature and have you always searched for that aspect of landscapes? The affinity I have toward nature fuels my creative drive. I am always intrigued by the surface of natural objects and the diversity of these surfaces. Yet, I am not one to paint exactly what I see; rather, I paint objects from a distance and add texture to the surface of the painting. I have been approaching my landscape painting not with the idea that I am re-creating a landscape, but with the aim to express its essence. The multi-layered paintings capture some fragment of the landscape, and the colors and texture aim to add a sense of energy. 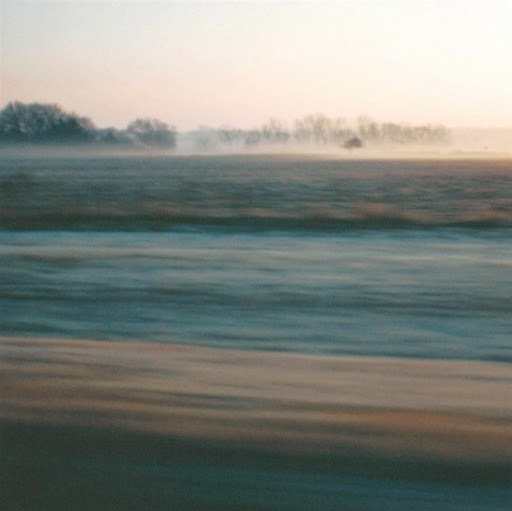 My goal with the photographs for this series (Speeding Glance) was to remove the details, yet have them recognizable as landscapes. I wanted to capture the essence of the landscape at a quick moment in time: that second when you see and recognize something without noticing the details. Sometimes a spot of color or an odd shape draws my attention to a particular place. With the Speeding Glance series, I would see a place that interested me, and I would come back to photograph it during the start or the end of a day when there was less light, therefore allowing the landscape to appear more abstract. To enhance this sense of abstraction I captured the images while driving, in an effort to make the foregrounds appear fluid. placement with Liz Rodda & Frank Wick. Independent curator Shannon Fitzgerald has worked with artists from students preparing for their first exhibition to internationally-known artists enjoying their museum retrospective. Since Fitzgerald leads an Artist Survival Kit workshop on November 19, I wanted to revisit some past interviews with her about working with artists, studio practice and more. She will share her experience as a contemporary curator, giving artists an understanding of professional development and mindful career steps. Read an interview Fitzgerald about working with local artists, studio visits and her selection process for the Art 365exhibition in this Art Focus Oklahoma issue. 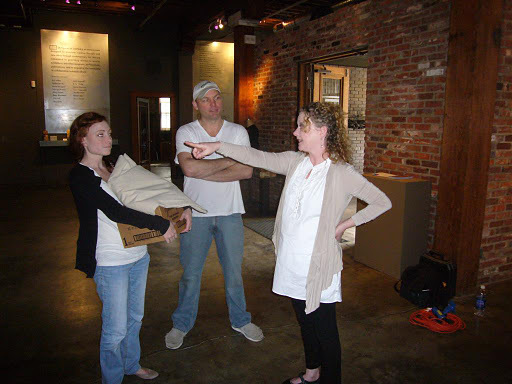 See this blog post with her ideas about curators visiting artists’ studios.